Funerals, like all significant rituals, arise out of basic human need - to take our dead to their place of final disposition. Every human society throughout the ages has performed this task not in any perfunctory manner, but with ritual and symbolic meaning in a community setting. One can think of a funeral as a sacred drama, where people of every culture act out what they believe about life and death, walking with the deceased "the last mile of the way" to take leave and commend them to whatever spiritual reality they embrace. Because we know one another through our bodies, funerals enable us to honestly confront the reality of separation and to engage in human sharing at its deepest level. The presence of the body - whether viewed publicly or not - provides a focal point for all of the changes -- social, emotional, spiritual and practical -- that a funeral seeks to observe. For most grieving people, going through, rather than around the difficult realities is most helpful and healing. As you participate in the planning of the service, you help create a relevant experience for everyone. 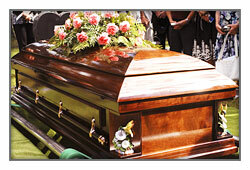 Funeral practices have changed in recent years from what was once a predictable pattern to many variations. As such, it is difficult to define what "traditional funeral" means. 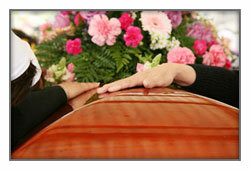 Today, funerals to varying degrees, reflect the personality of the deceased and a family's particular lifestyle. Also the change in our population means funerals reveal a wide range of customs. The Johnson Family staff is knowledgeable and receptive to those of all faiths, cultures and races. We take seriously our privilege to help families create services fitting their beliefs, are consistent with their traditions and maximize the experience of emotional support. We pay close attention to the protocols of every faith tradition, recognizing our vital role of enabling worship communities to do and be their best around death and funerals. A funeral can be held in one's place of worship or our service chapel. This is followed by a procession to the, graveside or to our crematory. It is Johnson Family practice to allow families to remain at the graveside as the casket is lowered into the earth or witness the placement of the deceased into the cremator. A reception or visitation is typically held at the funeral home or a place of worship the day prior or on the same day as the service. Visitation allows sharing of stories and memories as well as religious and fraternal rites, such as a Masonic rite or Christian Wake Service. Some families prefer to have the funeral at the gravesite. We make sure there are adequate canopies for inclement weather and lap robes for the family in cold weather. 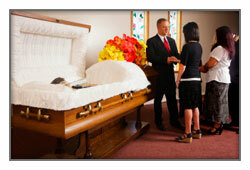 Some will opt to have a graveside service prior to a memorial service held at a church or our chapel. Years ago the family residence was the venue for life's events - birth, death and marriage. Despite today's norm of using a funeral home or worship space for the visitation or funeral, we are honored to accommodate anyone who finds it meaningful for their family member to be brought home one last time.